Q------How do I book a home? You may prefer to speak to a member of our reservation team. When making a reservation we require a $300 deposit. Payment must be completed 60 days prior to arrival and is non-refundable at that point.We also accept personal and certified checks,as well as money orders. Q----When is check in and check out time? A----Check in is at 4pm. To allow housekeeping access to the home we ask that you leave before 10.30am on day of departure. Variation to these times must be made in advance and will incur an additional charge of $50. Q---- What are your office hours? A---Our hours are 9am -6pm. After hours we operate an answering service. Calls are screened and emergencies will be dealt with. Non emergency items will be dealt with the next day. Q----Do you offer Travel Insurance? Q---What is the Property Protection Fee? A----This is a damage waiver that will cover accidental damages. Intentional damage or gross negligence will result in additional costs. Q--What is your change /cancellation policy? A-If you change your reservation there is a $20 non-refundable fee.No changes can be made within 60 days of your arrival. Cancelations must be confirmed in writing. The $300 reservation deposit is non-refundable and cancelations within 60 days of arrival will result in the loss of all monies,and any claims must be arranged with the travel insurance company if coverage was purchased. If the home is re-rented for the entire period rental money and taxes will be refunded less a $250 cancelation fee. Q-----Is the home I see on the internet the one I will get? Q------How many people are allowed to stay in each home? A -----Maximum occupancy includes infants and children and for fire regulations should not exceed what is posted for each home. Q---Is there air conditioning and heat? 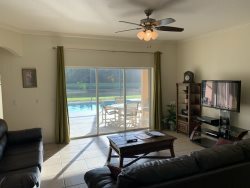 A- All the homes have central air allowing them to be cooled in the summer and heated on the cold days we occasionally experience in Florida. To allow them to work as effectively as possible windows and doors should be kept closed. Q--Is there a fully equipped Kitchen in the home? A---Wither you intend just to cook breakfast or prepare all your meals there the kitchen will have all the plates, pans, silverware,glasses etc to make you feel this is truly a "home away from home." Q---Is there a telephone at the vacation home? A----Regulations require all vacation homes to have a telephone to contact emergency services. Local calls are free. Long distance calls may require a calling card or credit card number for usage.The homes telephone number will be supplied in your pre-arrival e mail. It can also be found on the front cover of the homes information folder. This will be on the coffee table when you arrive. Q--- Is there internet in the home? A----All homes have wireless internet. The homes phone number , without spaces, is the access code to the Wi-Fi system. Q-----Are linens and towels provided? A---Yes. There is no need to bring your own linens. Towels are provided at twice the maximum occupancy and are stored in the homes towel cupboard. This is normally in one of the bathrooms. Some pool homes also supply towels specifically for use on the pool deck. These are stacked on the shelf above the homes washer and dryer.Additional bed sheets are in the closet in each bedroom. Q--- Are the vacation homes cleaned daily and fresh linens supplied? A---- No the home is cleaned prior to arrival and again once you leave. There is a washer and dryer to allow you to wash linens. If you wish you can request a mid-stay clean at an additional charge. A-----No we do not leave any chemicals in the home. There will be some basic supplies to let you settle in before going to the store. There will be toilet rolls and hand soap in each bathroom. In the kitchen you will find a couple of trash bags and a dishwasher tab for the first load. A--- In the interest of future guests all our homes are strictly non smoking. Should you need to smoke please do so outside on the pool deck or yard. A--Unless the home is advertised as pet friendly we do not permit pets.This is to safeguard future guests who may have health issues. Q---Is parking available for multiple cars , RVs ,buses or trailers? A---If you are arriving with more than 2 vehicles or oversized vehicles it is best to check with our reservation department as parking is limited. Larger vehicles are not normally allowed. Q---How close are the homes to the area attractions? A---All our homes are easy traveling distance from the areas various theme parks. They are also close to restaurants and shops. Q---- Can you supply theme park tickets? A---- Yes we can supply theme park tickets. Good deals can be had to anyone staying in a PRV home. Contact our office to discuss your requirements.They can be delivered to the home for your arrival.